Will Jackson has only been existing since the break up with his long term girlfriend. Then on Christmas Eve the most unexpected miracle lands right on his doorstep and his boring life will be turned up side down! This is a sweet story of letting go of the past and looking forward to new beginnings. It's very well done and leaves you with a smile. Definitely a book I recommend. 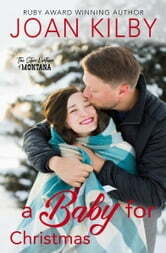 A Baby for Christmas is exactly what I expected from Joan Kilby, a sweet and enjoyable read. Mia (our heroine) is a woman who needs assistance desperately when Will (our hero) comes across her. She actually needs assistance through much of the book as she has had a string of bad luck due to her moral reprobate of a husband (who had died, very early in her preganacy). I liked the pace of the book and of Mia and Will's romance. It was not insta-love on both sides, which I would have found incredibly unbelievable. It was more insta-connection, where the characters felt a strong sense of connection and friendship early on and the romance followed the friendship at a fast but believable pace for the couples situation. The main characters are very likable and well written. The secondary characters are also well written, even though a few of them are not always likable. I would recommend this book to anyone who enjoys contemporary romance. I received an ARC in exchange of an honest review. A very good feel good story. The characters are good. I really enjoyed A Baby for Christmas by Joan Kilby, the second book in her Sweet Montana series. Widow Mia is almost nine months pregnant and on her way to visit her sister when a snow storm drives her off the road. Already in labor, Mia follows some Christmas lights to a building where Will is working on Christmas Eve. Will is recovering from a break-up with his on again-off again high school girlfriend. One would wonder if those two were really in love or in a rut. Will ends up delivering the baby thanks to Mia’s sister help, over the phone, and forms a connection with Mia and baby Will. In the meantime, Mia is being torn in a many different directions, her dead husband’s family, the baby, Will, her sister, to the point where she is afraid of taking any risks. One theme throughout this story is miscommunication or not telling the whole story, including trust and not lying. I enjoyed reading this book and had trouble putting this book down. Ms. Kilby drew me in and did not let go until I read the last page, reading this book in one day. I highly recommend this book to other readers. I voluntarily reviewed a complimentary copy of this book.